Nestled on the slopes of the continental divide, our newly released Montecito phase is embedded in a old-growth rainforest overlooking the San Juan, Nacascolo and Toro Bays. 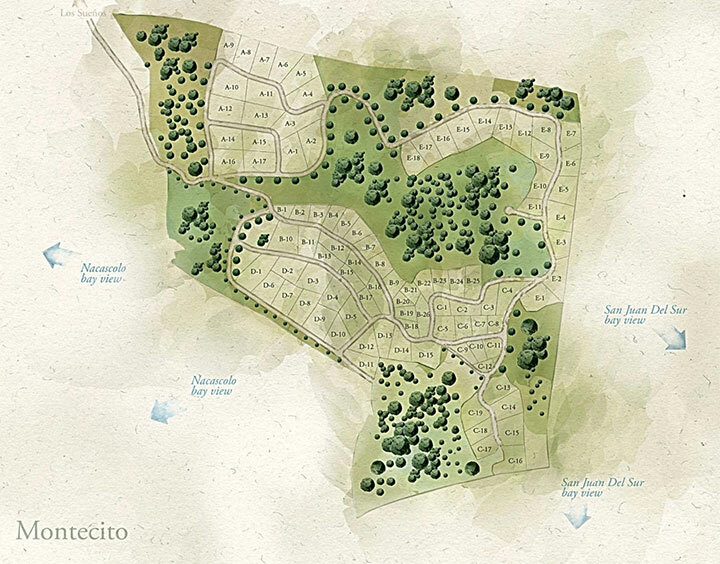 These secluded lots are surrounded by a paradise of ecology, offering an unmatched quietness and the opportunity to build your dream home in harmony with a flourishing green space. You can see for miles from Montecito, out to seemingly endless coastlines, wild valleys and verdant hillsides speckled with the pink and yellow of seasonal blossoms. Montecito has over 50 lots set along the ridge, each with its own unique character. The A and B Lots are cradled between peaks with views of Nacascolo Bay, while the C Lots on the South Ridge can see all the way to the fishing boats in the Bay of San Juan. Lastly, the D and E Lots located on either side of the ridge offer a range of vistas over the Pacific. Lots start at $19,900 and range in size from under a quarter acre to over three quarters of an acre. We are interested in talking about a lot with someone.